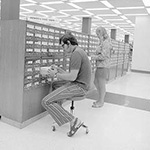 A lot has changed at UBC Library over the last 40 years. Buildings have been raised up and torn down, collections moved, technology revolutionized, and staff have come and gone. One thing has remained constant, however: our commitment to providing excellent services, spaces and collections for students, faculty, staff and community members. We invite you to explore the following images as an illustration of where we’ve been, where we are now – and to imagine the possibilities of where the Library will be in the future! 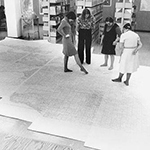 The Library’s Geographic Information Systems (GIS) Lab ensures that nobody need spread a map on the floor and stand on it ever again. 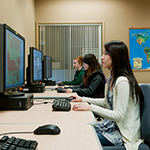 The lab houses six workstations that allow users to manipulate data and produce graphic representations of the results in geographic settings. That may mean tracking changes in sea levels, displaying the complexities of overlapping territories in First Nations land claims, or analyzing movements of improvising modern dancers. 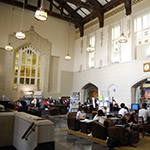 Fewer card catalogues and more flexible study space greet visitors at the Chapman Learning Commons in the Irving K. Barber Learning Centre, located in the concourse of the former Main Library. Today, the Learning Commons provides tutoring, writing support and peer academic coaching services for undergraduate students. The learning tools available to UBC students studying at the Library have changed dramatically over the years. 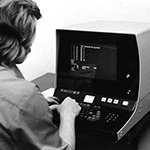 Computer hardware from 1973 provides a sharp contrast to the Mac computers currently available at several Library locations. Before the gleaming glass walls of Koerner Library were raised, Sedgewick Library served as an active student hub with many notable architectural details. The original entrance is still visible today, looking across the garden plaza level. The recently renovated lounge and study area on the third level (main entrance) of Koerner Library includes a fireplace, computer lab, flexible seating and a popular reading collection. 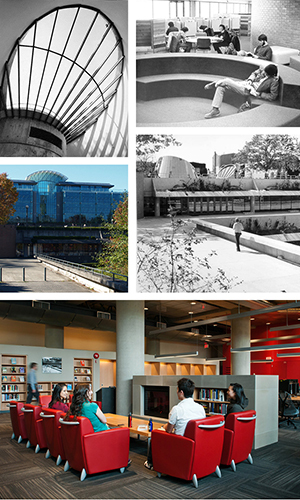 Clockwise from top left: Rhone & Iredale Architects skylight design, 1972; student study space in Sedgewick Library, 1973; entrance to Sedgewick Library, 1973; renovated lounge and study area in Koerner Library; main entrance, Koerner Library. Spending hours flipping through card catalogues is a thing of the past. 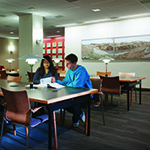 The renovated Garden Level at Woodward provides students with a space for collaborative work and quiet study. It features new computers, and is complemented by plenty of natural light and original art on the walls.